Premier Fine Clipping Blade Set by Premier 1 Supplies at Annie's Dog Spa. MPN: 873000. Hurry! Limited time offer. Offer valid only while supplies last. Superior blade quality. They hold a cutting edge longer. Teeth enter and push easily through dense wool and fiber. Leaves an even, attractive finish. Superior blade quality. They hold a cutting edge longer. Teeth enter and push easily through dense wool and fiber. Leaves an even, attractive finish. We sharpen all new blades before we sell them - so that factory edge finish is actually from Premier. Our resharpening methods remove less steel than others - so a blade set can be resharpened up to 10 times. 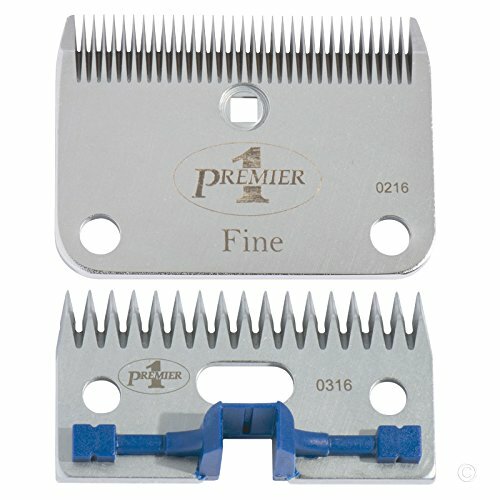 Premier blade sets fit Premier clippers 1000c, 3000c and 4000c. Premier blade sets also fit Lister® Star, Stablemate and Laser and Neon clippers. For slick shearing sheep and clipping cattle, goats, club lambs and horses. Preferred blade set for body clipping performance horses. If you have any questions about this product by Premier 1 Supplies, contact us by completing and submitting the form below. If you are looking for a specif part number, please include it with your message.